Air admittance valves let air flow directly into your toilet drain pipe when you flush the toilet. Since air moves through the drain when water moves through the drain, you need a vent to avoid plumbing issues such as water hammer. Installing the valve takes some special plumbing skill, but is nothing the average person can not handle. 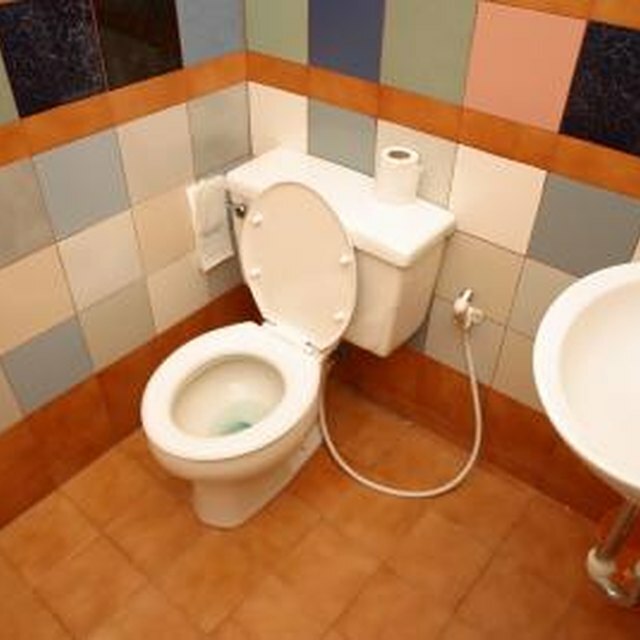 You will need to have access to your toilet drain pipe, which runs from the toilet itself to the home's main drain line, called the drain stack. Locate the drainage pipe in the flooring directly below your toilet. Trace the route of the drainage line to a 4-inch pipe, which is the home's main drain line. Saw through the toilet's drain line with a pipe saw about 4 inches before the pipe connects to the drain stack. Plumbing codes dictate how far to place the vent from the toilet, so consult your local code book. Install a tee fitting at your cut by sliding the two ends of the cut pipe into the two opposite ends of the fitting. Push your air admittance valve into the other inlet on the fitting. If necessary, adjust the fitting by turning it to the left or right so the valve does not interfere with any obstructions. Remove the valve and the fitting once you are sure they fit properly. Coat each end of the fitting and valve with PVC glue. Assemble the vent and fitting once more, and let the glue dry for four to eight hours or as the label recommends.